We can mill your logs for you. We have a portable bandsaw mill capable of milling logs up to 900mm wide. Being a bandsaw this is very efficient and there is little waste of the log. We are familiar with most milling techniques including quarter sawing. We do not just “slab” logs unless that is what is required. Logs larger than 900 can still be cut with the bandsaw, we will just cut it into smaller sections first. Milling is usually done at our premises, but we can mill on your site if required. We also have a Lucas Mill capable of slabbing up to 1.9m wide. Logs shorter than 2.4m or with a diameter less than 300mm will usually not be viable to mill. NOTE: There is a minimum $110 charge for milling. In addition, we can also machine and sand your timber for you. NOTE: There is a minimum charge for machining/sanding. 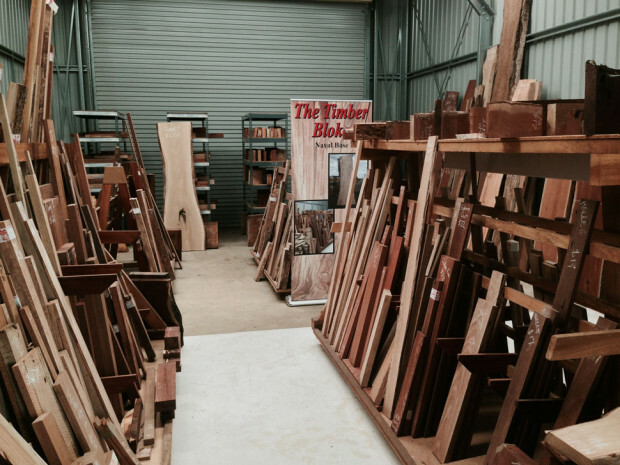 Co-ordinating two or more different timbers for your project is a very rewarding exercise. Derek brings years of experience and sheer enthusiasm in helping his customers find the best timber for their project. Derek can help you find the right board or slab for a particular look or impression you’re trying to recreate, matching an existing piece, or a feature in grain, pattern or shape. Everything from a jewellery box, to a large piece of furniture, to a whole kitchen can be enhanced by using different coloured timbers. Inlays are also available for that fine piece. Derek brings his expertise in picturing the finished product thereby helping you to find the best pieces of timber to gain the optimal outcome for your project. We have a wide belt sander capable of sanding pieces up to 900mm wide. In addition we can hand sand your pieces for that final super smooth finish. Your timber can be machined by us whether you purchased it from us or not. We can machine slabs flat up to 5.5m long and 1.8m wide. Normal boards can be square dressed as required. Our thicknesser and planer can machine up to 410mm wide and as thin as 4mm with some species.